The house, located in St Kilda, Melbourne was in a dilapidated state when the owners acquired it and a heritage overlay required that the façade be retained. While there was little to retain from the original house they wanted to restore the essence of the original home while adding new layers to its story. The original cottage has been described as a Singapore prefab, built in the 1850s. The framing was marked with Roman Numerals to enable it be put together after it being shipped and delivered on site and to be taken down and relocated if required. Apparently there were a number of theories as to what the building had originally been used for: a general store, a halfway house for farmers and travellers or even a brothel (due to its location and the fact that floor markings indicated many small rooms). 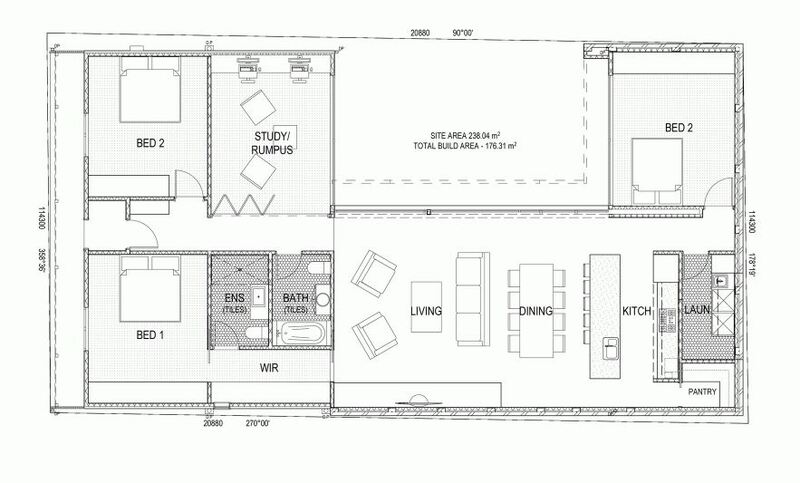 The brief for Jost Architects, called for an open plan living, kitchen and dining area as well as a living room, a rumpus room, a bathroom, a walk-in laundry, a walk-in pantry, a master bedroom with its en-suite and walking wardrobes, a second and a third bedroom as well as an outdoor space. The areas needed to be linked creating an open flow throughout the house. The owners wanted a house with broad appeal that could operate as a family home but be adaptable. The biggest obstacle was the limited site size of 238m2. The final design was a U-shape facing north, organised around a back yard, with a rear addition and some modifications to the original floor-plan. While the owners waited for the plans to be approved they started to remove layers of original horsehair plaster and rusted pressed metal to expose cathedral ceilings and four front doors. Original wallpaper was also discovered and was later used as inspiration for the house’s colour palette. As there was very little to be salvaged the owner chose to “capture the essence, rather than the actual fabric” of the house. 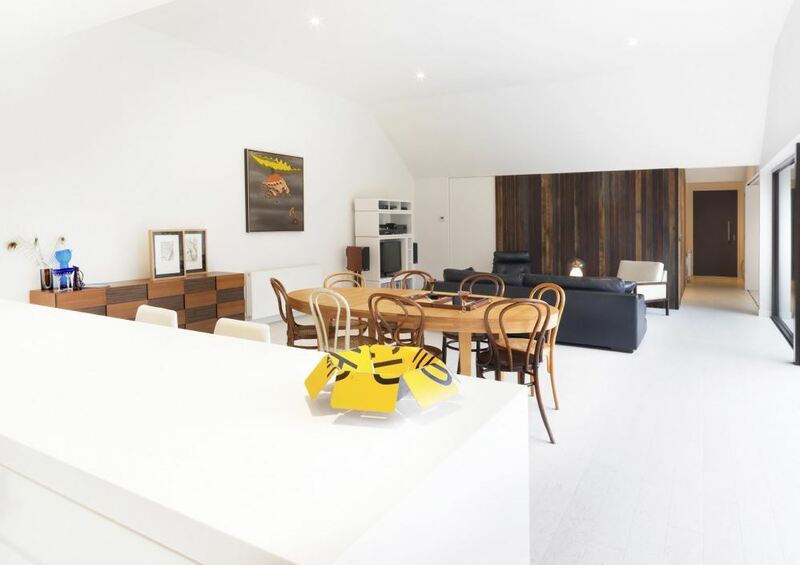 A lucky find was the wide sugar cane boards from the external walls which were painstakingly cut, patched sanded and prepared as cladding for the façade and then used to provide inspiration for vertical paneling throughout the interior. Throughout the house, modern and traditional finishes blend and create stunning contrasts. 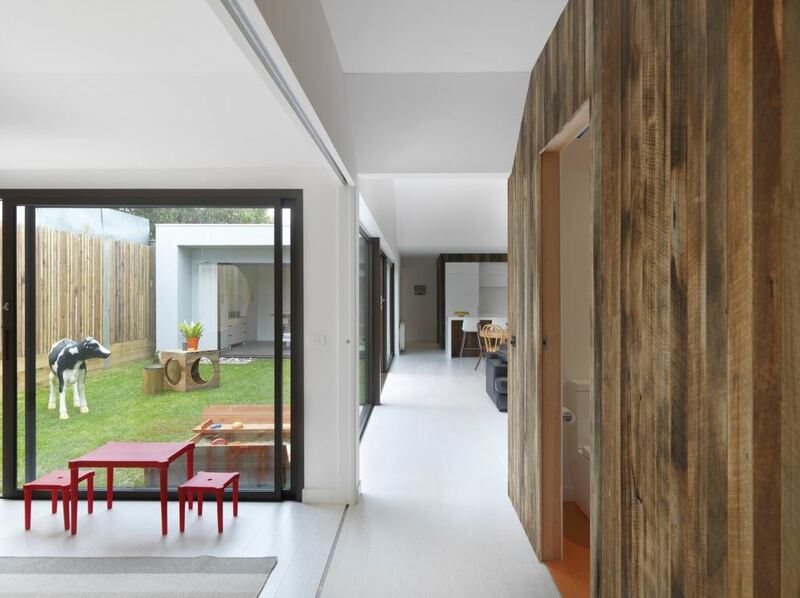 Cork and rubber were used for the flooring, while recycled timber was used for the cladding. Materials and finishes were selected to be hard-wearing and maintenance-free, to endure the enthusiastic creativity of young children. As is often the case with small projects the considerable discussions during the design and documentation process, ultimately resulted in the prioritising of items based on cost and value for money. Decisions that led to the use of long-lasting and durable sustainable materials, the use of hydronic heating and the omission of air conditioning. The planning and structural co-ordination endeavoured to minimise the use of steel, favouring timber framing through sensible spans and cantilevers. 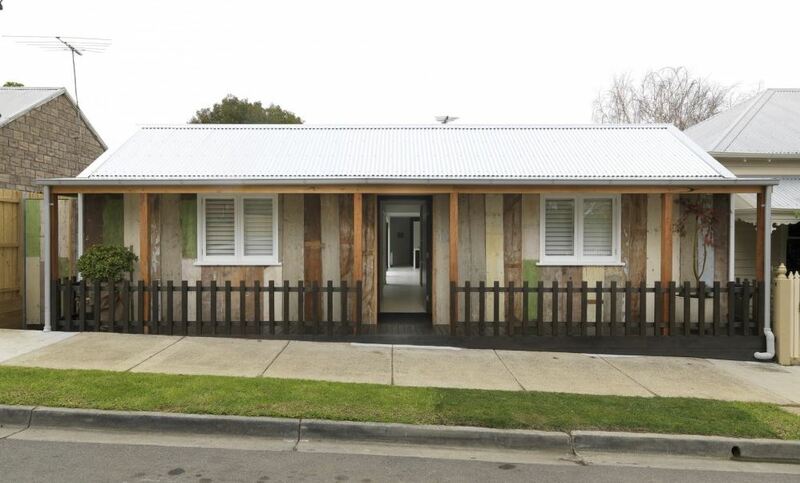 But ultimately what stood out in terms of sustainability, was the common sense application of standard, good thermally passive design techniques. The project has revived a terribly neglected but still important building with an original blend of the old and new. The simple aesthetic of the façade conceals a well-designed free-flowing home at the rear and is said to regularly generate interest with passers-by. It will only improve with time. This approach may not be for everyone but this was no easy fix, particularly with a limited budget. We love the fact that the architect acknowledged that “part of the enjoyment of the process for everyone involved was learning about its past life, something which I often ignored, not intentionally, by concentrating on the “new part” of a project where an old building is refurbished and extended”. Understandably this is often the case. In order to assist the architect in their design process, MHM encourage owners to learn about the history of their house at any early stage.